It's road movie, which unfolds in the southern Argentinean region of Patagonia. 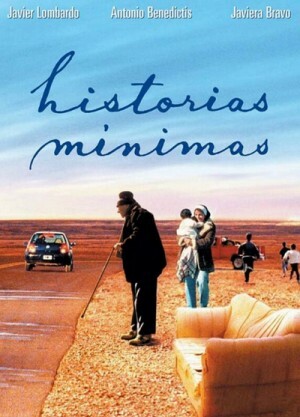 "Historias Minimas" unpretentiously chronicles a trio of separate yet interweaving stories about ordinary people attempting to follow their dreams. The octogenarian Don Justo (Antonio Benedictti) has handed over the running of his grocery store to his son and daughter-in-law. Fading eyesight prevents him from driving, but he resolves to hitchhike to the distant town of San Julian, where somebody has spotted his beloved missing dog, Badface. Elsewhere, an obsessive travelling salesman, Roberto (Javier Lombardo), is planning to surprise a young widow with the gift of a birthday cake for her kid. And in the third, less developed segment, the impoverished Maria (Javiera Bravo) is heading to the recording of television game show Multicoloured Casino with her baby, intent on gaining a prize. Hi, could you please reupload it?? Thank you!